ADDRESS OF BENUE STATE GOVERNOR, SAMUEL ORTOM, AT THE FOURTH STAKEHOLDERS’ MEETING HELD ON MONDAY, 22ND MAY, 2017, AT THE PEOPLES HOUSE, MAKURDI. 1. It is a privilege to meet once again at this occasion of the Fourth BENUE STAKEHOLDERS MEETING. We have found this dialogue to be one of the most rewarding element of our democracy. This kind of interaction enriches democracy and according to Aristotle, this is considered the purity of democracy. 2. It is my joy to see great sons and daughters of Benue State here assembled, cutting across religious, ethnics and political divides. I can see that some people are coming for the first time. I warmly welcome you all. 3. My Deputy, Engr. Benson Abounu and I, will continue to appreciate the citizens of Benue for providing us the opportunity to serve them. I always want to remind you of our promises at the beginning of this regime. My resolve is to be the governor of all and will always enjoy consultation with you. It is through this dialogue that citizens will have their say in governance. 4. Members of my Executive Council are charged to hold town hall meetings with their people at the Local government levels. This will allow for more interaction and more information on the activities of government, and particularly what government is doing to enhance the welfare of the good people of Benue State. 5. In the last ALL Benue State Stakeholders Meeting we held here, I gave you a comprehensive brief of the activities of our government as from inception. We spoke of the hardships of take-off due to the deficit treasury we inherited. We mentioned the money borrowed to take-off. We spoke about the total collapse of government and public institutions at the time. Salaries, gratuities and pensions were not paid and the people were wallowing in pain and despair. We also reminded you of the Labour unrest that loomed in the state at the time with closure of many institutions including the Benue State University. We also reported the outcome of the Justice Kpojime Commission. 7. We must begin to appreciate non tangible achievements. Achievements that comes in form of good and enduring policies and executive directives are most important because they provide the foundation and direction of our economic development. The first two years of this administration have being a season of bold decisions that have defined our development trend. 8. We successfully executed an Amnesty program that ushered in peace and tranquility to Benue state. The program call youth to surrender their weapons. Over 600 surrendered and are being rehabilitated to take up new livelihood. We have flushed out hoodlums from our streets. A leading criminal and some of his followers who are still alive are no more able to operate in the state. They now live in the bush, moving from one forest to the other, hiding from security agencies. Ghana’s being on the run. He has been cornered and will soon be caught. 9. In obedience to God and through confessions and two weeks of prayer and fasting, we dedicated Benue to God. As a government that believes in God, we are now reaping the benefits of our action including wisdom, knowledge and blessings from the Lord. The dedication of Benue to God has led to many other good things that have happened to us and will continue to happen to Benue. 10. We initiated an executive bill that led to the amended Chieftaincy Law that has been used in the appointment of Traditional Rulers across Benue state. We supervised the free and fair appointment and installation of the Tor Tiv, First Class and Third class Chiefs across all of Benue. We have been told and we know is true that ours has been the freest and fairest procedure ever used in the selection of Tor Tiv. No wonder the Tor Tiv the 5th is widely accepted by all Tiv people including those in diaspora. The appointment of First class, and Third class chiefs in Idoma, Igede and Tiv were done in the most transparent way and there was no peddling of influence and money. Government officials supervised the process and with the help of God the appointment of chiefs has enhanced peaceful co-existence in our land. 11. We have pioneered and promoted Ranching as the solution to farmers/herdsmen crises. Nigerians know and deeply appreciate our contribution on the debate of finding solution on the Herdsmen/Farmers crisis in our country. In leading this debate, we never looked back, but do so both locally and nationally calling on Nigeria to adopt Ranching as an international good practice in Cattle rearing in Africa and other continents. 12. To back up our campaign on Ranching we sponsored Anti-Open grazing as an executive bill which has just been passed into law by the State House of Assembly. This law bans open grazing of animals in Benue state and calls on the use of ranching. This is a remarkable event that will put an end to the problem of herdsmen with farmers. Our farmers have suffered a lot from the hands of herdsmen and many communities including my own home LGA of Guma, have suffered and lost many relations to death as a result of attacks from herdsmen. 13. Distinguished ladies and gentlemen, it saddens me that we have lost lives and property to this senseless conflict, over time, even before my Government came on board. My interactions with people far and near has convinced me that this remains the best solution to this problem. We are determined to serve the people of Benue state, openly and within the ambit of the Law. From this moment, the law should take its course and our farmers are expected to rest from the menace of herdsmen attacks. Let me use this forum to clear one thing about prohibition of open grazing law 2017. It is not to send herdsmen away. Herdsmen can freely live in Benue provided their live stocks are ranched. To be sure, ranching is not only for Fulani. All persons who have live stock in Benue state must have them ranched or face a 5year jail term or 1million naira fine. 14. The Justice Kpojime Commission will ever remain a remarkable event of our government because if you ask the wrong questions, you cannot have correct answers. Justice Kpojime Commission put in place by our government enabled us to ask the correct questions. Even if we are yet to have the answers, we sure know that the questions the Benue people asked through the Kpojime Commission are correct questions that must be answered by those concerned. 15. Our Government understands labour relations. We have not taken workers and their union leaders for granted. There has been Labour peace. Let me commend the workers of Benue and the Labour Unions for their understanding and sacrifices for the future of our children. In spite of the recent deviation by the ASUU of the Benue State University (BSU) we remain committed to the welfare of all workers. I wish to assure all workers that we will clear salary arrears. I know of States that have not paid workers for over 12 months, but I don’t want to be like those States. I was voted into power so that workers will enjoy their salaries. I have paid salary each month since I took over However, I still have salary arrears of 4months for state civil servants and 8 months for Local government staff. By the grace of God I will pay outstanding salary arrears and pensions. 16. Ladies and Gentlemen, recall that the Benue State Stakeholders in an earlier meeting resolved that BSU be placed on first line charge for salary payment thus they have been paid up to date including their earned and academic allowances. Sadly, in spite of government efforts BSU Unions went on indefinite strike last month to request payment of arrears of earned and academic allowances accumulated six years before the coming of the present administration. I found that Benue State University is better off in this regard than many federal and state universities. I wish to report this to you Stakeholders to know the reason of this current strike and its unfortunate turn of events. 17. Payment of salary arrears, pensions and gratuity is the essence for the declaration of State of Emergency on payment of salaries. What we get each month is not enough but because you voted me to solve the problems of Benue State, I am determined to do just that. 18. A state of emergency on Salaries was declared when we found our resources unable to pay 4 -7 months salary arrears to State, LG employees and Pensioners. What does emergency on salary mean? It means the concentration of resources, energy and effort to clear arrears. It means looking for creative ways to pay salaries going forward. It also means bringing dignity to the Benue worker once again. 19. Some may ask how did we get here? Many of you know that the minimum wage was poorly handled in Benue State by the last administration. It is only in Benue state that we have Civil servants earning fraudulently, salaries higher than the Governor and his deputy. We have detected the crafty transfer of potential retirees to tertiary institutions, in order to gain additional 5 years, without lecturing experience, and at double their salaries. There are cases of Promotion based on unauthorized certificates, abuse of allowances, and of course, ghost workers, mainstreaming and scheduling Payment of double Salaries etc. 20. The Committee saddled with investigating this matter found in their interim report that N1.47bn has been lost through these unwholesome methods, in one year and three months. Even so less than a quarter of the MDAs were converted. We are studying the recommendations with a view implementing them in a fair manner, and meting out punishment to those culpable. The emergency measures declared will deal and end these issues once and for all. 21. But when would the Emergency on Salary Declaration end? This action would end when we are up to date on Salary and pension obligations. It will end when we have plugged all leakages in wage bill administration. And finally, it will end when our sources of revenue exceed aggregate Capital and Operations expenditure of Government, on a 3 months back to back, consistent basis. 22. We need to complete and institute democracy at the grassroots. 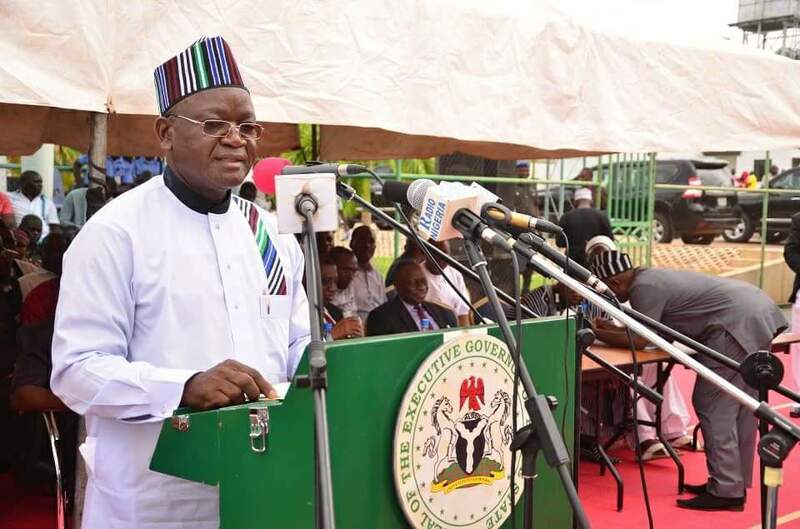 By June 3, Benue indigenes will go to polls to elect local government chairmen, councilors and LGA Councils. I call on all citizens to keep a date with 3rd of June 2017 and go out en mass to excise your franchise and elect local government chairpersons and councilors of your choice. 23. It is well known that we chose the empowerment of Youth and Women as our cardinal objective. In this regard, and given the technology savvy nature of our youth, we are evaluating the designation and use of Internet enabled Parks in the Capital and other places, to get the Youth consummating their businesses, advertising their wares and interacting with their counterparts freely. You can imagine therefore my surprise when pictures of wheelbarrows were being circulated as my Youth initiative. I know that we suffer blames as leaders in all that happens around us, but let us be discerning to dismiss the mundane and bizarre concoctions that are thrown at us by sponsored opposition. 24. Our administration has remained committed to its core values which are anchored on the fear of God which explained our objective of dedicating the state to God last year. These include transparency, accountability, fairness, justice, humility, selflessness, discipline, integrity, integration, forgiveness, reconciliation, peace and unity. We believe that these values make development inevitable. 25. We have continued to emphasize zero tolerance for corruption and have warned that government officials who divert public funds into personal use will be punished. We have continued to reiterate that our philosophy emphasizes that public office remains an opportunity to offer quality service to the people. Those who intend to make money are being encouraged to get into the private sector to do business for which we are creating an enabling environment. 1. Many of the primary schools are now completed and many are at various stages of completion in the 23 local government areas of the state following the release of N7.6 billion. 2. Renovation of some secondary schools especially Government Girls College, Makurdi is completed. Government College Makurdi is being renovated at the cost of N205 million Mathematics teachers are recruited to strengthen science education. The National Mathematical Centre in Abuja has held workshops with Mathematical teachers in Benue State to improve to improve teaching of Mathematics in the State. We all know that Mathematics is a gate way of students who are interested in the sciences. 3. Resolution of disputes with unions a few days after taking over and the resumption of Benue State University (BSU) from a prolonged strike. 4. Constitution of Visitation Panels for state-owned tertiary institutions and commencement of implementation of the BSU panel's report as well as reconstitution of the Benue State University Council. 5. Increase of carrying capacity of the university from 4, 655 to 6, 000. 8. Re-training of 10,000 primary and 6000 secondary school teachers. 9. Plans are underway to return mission and private schools to their proprietors. 10. Establishment of Benue Peoples Education Project (BEPEP) to raise funds for development of education in the State. 2. In two years we have graduated of 152 medical doctors who are now working in Benue and other part of the country and abroad. 5. Establishment of Primary Health Care Board and constitution of its board. 10. Provision of motorized boreholes and public toilets under SDGs and its partnership with DFID in parts of the state. 2. Evolved a new policy for procurement of fertilizer at highly subsidized rate of 38% to Benue farmers. 3. Facilitation of N2 billion CBN Anchor Borrowers Scheme agricultural loans for disbursement to Benue farmers. 4. Introduction of land clearing and dry season farming. 6. Commencement of work after signing of agreement with Torra KFT for the completion of the Wannune Tomato Factory which is aimed at creating hundreds of jobs for the people. 7. The same approach is being applied to other comatose state-owned industries. 8. The plastic industry that was concessioned out has also started production as well as the live stock feeds production plant. - Partnership with NNPC for the establishment of Ethanol project in the state. - Trimming of Government by reducing the number of Commissioners from 17 to 13 and advisers from 28 to 20. Reduction of the travels of government officials to cut the cost of governance. 2. Appointment of President, Customary Court of Appeal, two Judges of the Customary Court of Appeal and One judge for the State high Court. 4. Inauguration of the Advisory Council on Prerogative of Mercy and granting of amnesty to over 100 convicts. 1. Introduction and prosecution of Amnesty Programme using carrot and stick approaches which led to the recovery and destruction of over 600 arms and light weapons, thousands of ammunition while over 900 youths embraced the amnesty and surrendered their weapons. The initiative has brought peace to various parts of the state. 2. Sustained effort for the promotion of peace between farmers and herdsmen as well as deepening inter-state peace building efforts with Taraba and Nasarawa States. 3. Contacts with the Presidency, Chief of Army Staff and Inspector General of police with efforts to contain herder's assaults in Agatu, Tarka, Makurdi, Logo, Buruku and Guma. 2. Setting up the Administrative Commission of Inquiry into the sale and lease of government property within the same period. 3. The Judicial Commission of Inquiry submitted its report recently and indicted 52 individuals and 10 corporate bodies who are to refund over N107 billion to the coffers of the state and further investigate the misappropriation of N44 billion. 4. A white paper was issued on the Justice Kpojime Commission's report and implementation is in progress. 6. Inclusion of labour unions like NLC, TUC and NUT for the first time, as part of the joint account committee. 2. Proactive steps taken to boost the Internally Generated Revenue, IGR of the state by introducing the Point of Sale (POS) machines. 1. Collaboration with the National Information Technology Development Agency, NITDA for the establishment of Benue State Information Technology Development Agency, BITDA and formulation of an ICT for the state. 2. Procurement and installation of new transmitters at Radio Benue and at Idekpa sub-station which will soon resume transmission while reconstruction of Katsina-Ala station will start soon. 3. Partnership with the Federal Ministry of Communication Technology and the Rockefeller Foundation for training of 1,500 unemployed youths from the 23 local government areas of the state on how to access online jobs. 4. Provision of land to the Nigerian Communication Commission for the establishment of Digital Institute in Benue State. 1. Re-engagement with Development Partners, UN, UNHCR, UNFPA, World Bank, IFAD, USAID for the provision of Education, Health services etc. 2. Signing of MOU with Chinese, German and American investors on infrastructure. 3. Payment of over N5.5Billion counterpart fund to local and international development partners. 3. Provision of three motorized boreholes and construction of drainages at Government Girls College, Makurdi. 4. Provision of boreholes for the people of Jaki village in Kwande and parts of Vandeikya local government areas. -Reinvigoration of the Benue State Rehabilitation Centre, Apir and provision of vehicles and other support. - Care for widows and orphans through support programs of the Eunice Spring of Life Foundation. 27. The above list is not exhaustive and we have directed Ministries, Departments and Agencies to brief the press on their achievements since the inception of our administration. It would not have been possible to accomplish the foregoing without the support and patience of the good people of Benue State. We appreciate and cherish the confidence you continue to repose in us. 28. We will continue to appreciate the role of all major stakeholders including the Speaker and members of the State House of Assembly and the Chief Judge, the President, Customary Court of Appeal as well as all judges and staff of the judiciary. Our appreciation also goes to members of the national assembly, you the major stakeholders, traditional rulers, spiritual fathers and all other leaders in the state for support and contributions to the development of the state. 29. As your governor I know my mandate and contract with the people of Benue. I pledge to continue to work hard in the morning, by day and at night to realize my mandate. I will continue to covet your kind prayers and will always invite you for healthy interactions. It is only through dialogue that we will reach our goal with mutual success. 30. Finally, distinguished ladies and gentlemen, let me thank our Lord God for thus far He has led us. We have dedicated our State to God and He is already helping us. “We are able to go out and take Benue State, to possess the land from North to the South. Though the giants may be on the way to hinder. But God will surely give us victory. Only move to the righteous side. Move on to the righteous side with God”. 32. Thank you and God bless. 33. In God we trust.